World’s hottest math teacher Pietro Boselli says he would love to live in the Philippines. 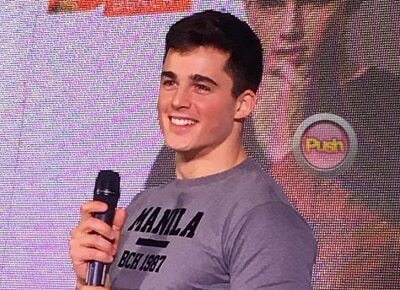 During his launch as the newest international endorser for Bench, model and former math teacher Pietro Boselli charmed the local media with his answers during the presscon. The former lecturer at the University College London said he is excited to visit the country for the first time. “I am planning to visit all the 7,000 islands. One island per day so I’ll be here for about 21 years so I hope the Bench funds don’t run out so quickly (laughs). This is my first time here so I want to make the most of it. I am obviously very honored to be here as an endorser of Bench. I really love swimming and diving so I want to do some free diving and scuba diving or try some extreme sports or something,” he shared during the Pietro Boselli For Bench presscon held last March 12 at a hotel in Taguig city. The Italian-born hunk admitted he wasn’t always proud to be called a model especially when he got his PhD in Philosophy. “At the beginning of my academic career I would keep secret the fact that I was a model because I felt that people looked down on that. Only through growing up and maturing that you learn how to embrace and realize and really see that that is amazing because the two things are so different. Sometimes it happens that people see me and they assume things, the last thing they would think is that I have a PhD for example. Still now people have a problem addressing me as doctor,” he admitted. Pietro said that he started modeling when he was six years old while his love for math got cultivated in his teenage years. “Up to the age of 14 or 15 I was a good student but I wasn’t the best. At some point something clicked in my head and suddenly that was my passion. In fact, my mom she’d be pushing us to study. We were a big family so there was always stuff to do, helping the house and my dad always says we have to help out. There were responsibilities. It’s part of your environment of course but it’s not something you can force upon people. In my case, I couldn’t wait to leave and go and see the world. I didn’t want to stay at home and be stuck there. Maybe that was what motivated me to work so hard the way I did. I love my family. I love my hometown. I think my love for it grew in the years I was away,” he shared. Being one of the youngest mathematics lecturers at the school, Pietro said he has learned to deal with students who have also become his fans in and outside the classroom. “I started teaching at 21. I had 100 students every year and sooner or later someone would find out I was modeling as well. So over the years there were always Facebook fan pages and posts. I wasn’t on social media at all. I refused to have Facebook. I refused to have Instagram or anything at all. So my friends would show me the page and some of them were really amusing actually and funny. When I teach I thought they were taking pictures of the board (laughs),” he recalled. When one of his student’s posts went viral, Pietro got hailed as the “world’s hottest math teacher” which he said overwhelmed him at the beginning. “They even wanted to fly me to L.A to do talk shows. I told them I’m not going to L.A for a show. My first reaction was like that. And then slowly you understand how to handle it and what to make out of it. But at the beginning I didn’t know what to do with it. But then I understand that I have a wide audience now,” he added. Pietro walked the runway at the finale show of the Bench Fashion Week last March 12 at the Bench Tower in BGC in Taguig.